Internet, please forgive me, I have created yet another mythical being to con my children into doing something they don't want to do. Her name is the Hairy Fairy. As I explained to my girls, the Hairy Fairy is a rather unfortunate soul. She has the most awful hair. It is stick straight, thin, and the color of smashed peas. She tried everything to make her hair curly like Vivi, Jude, and Elie's but nothing has ever worked and she felt very sad about that. 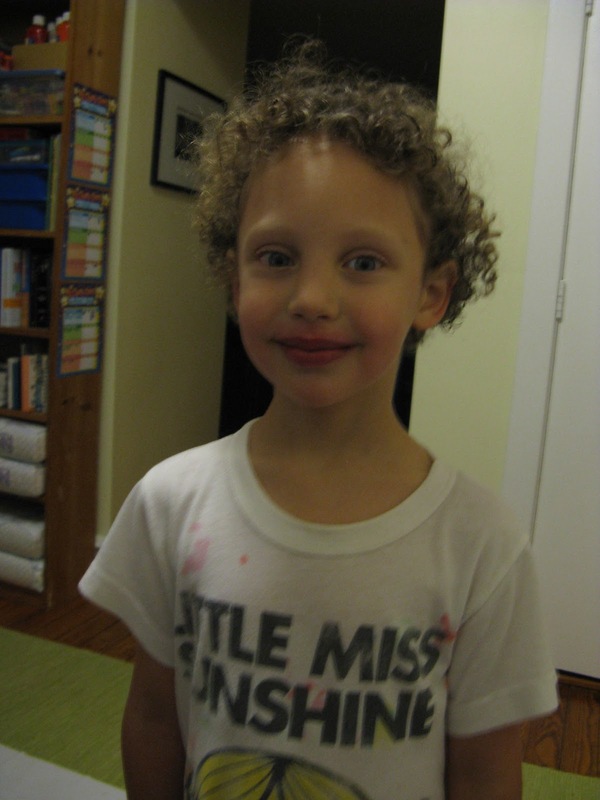 One day, she realized that the only way that she could ever have the beautiful, curly hair she admired so much would be to take the curls that big girls like mine no longer need. That was how she magically transformed from sad sack to magical fairy hair collector. Because the Hairy Fairy knows that not every girl wants to part with her curls, she leaves a treasure behind to thank the girl for her kind curl donation. I had Vivi at the word "treasure." So, after months of months of "growing her hair straight," Vivi consented to a hair cut. She said good-bye to several inches of curls and I said goodbye to the tangles, the partial dreads, the 45 minute comb-out after every bath, and the seemingly endless amount of tears and tantrums related to the hair. And that child above is $2.00 richer and has finally stopped asking for a straightening iron. Ya do what ya've gotta do! As a side note I just google searched: Curly Girl and my image comes up first as well as a blog post I wrote about curls. Hmmm.